San Francisco, CA and Dublin, Ireland; Thursday, 1st February, 2018: Windows 10, Microsoft’s operating system, overtook Windows 7 for the first time globally in January according to independent web analytics company, Statcounter. 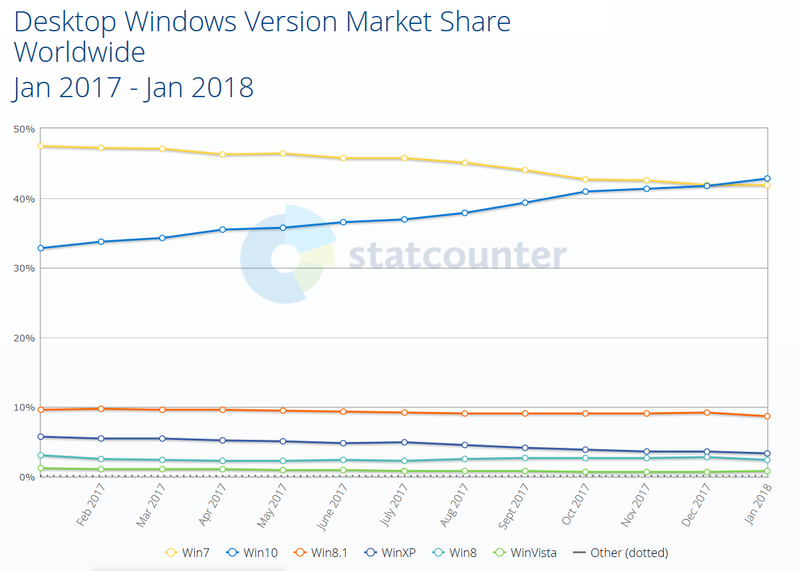 Its research arm Statcounter Global Stats finds that Windows 10 reached 42.78% in terms of worldwide internet usage compared to 41.86% for Windows 7. “This is a breakthrough for Microsoft,” commented Aodhan Cullen, CEO, Statcounter. Windows 10 overtook 7 in North America in January 2017. In the UK Windows 10 passed 7 in June 2016. The data is based on Statcounter Global Stats. This provides media, researchers, analysts and interested consumers with a free service to help analyse internet wars as the major vendors battle for dominance across operating systems, search, browsers, desktop and mobile. Statcounter (www.statcounter.com) last year launched an upgrade of its core website which provides web analytics, including a free option, to help companies, agencies, bloggers, self-employed and charities measure, analyse and understand visitors to their own sites.